I seem to be partial to bitter tasting vegetables these days. Maybe it’s an age thing. As I get older, I begin to appreciate them more. One of them is this vegetable called Gai Choy (Chinese mustard greens). 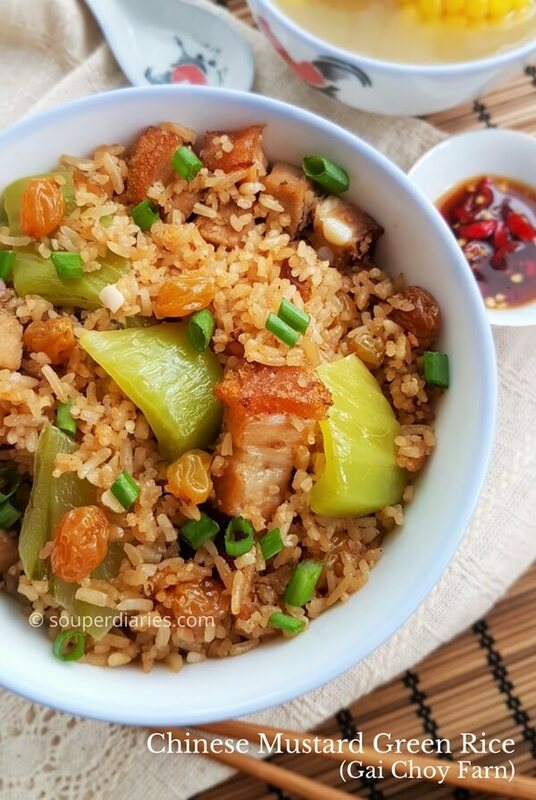 I love using it to make a one-pot vegetable rice meal and always with some meat. For today’s Chinese mustard greens recipe, I am making a flavorful Gai Choy with Roasted Pork and Raisins Rice. Kai Choy or Gai Choy is the Cantonese name for Chinese mustard, a pungent vegetable from the mustard plant species that is slightly bitter tasting. They are also known as Indian mustard and leaf mustard. At S$6 per kilo from the market, it isn’t exactly cheap but it’s worth every cent of it. Gai choy is a versatile vegetable that can be cooked in many ways. One of them include the absolutely delicious and appetizing Chai Boey. 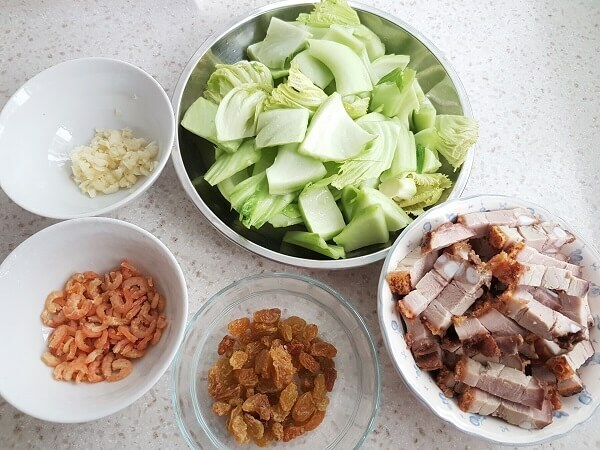 Clockwise from top left: Minced garlic, Chinese mustard (gai choy), roasted pork, golden California raisins and dried shrimp. Above are the ingredients that I used for this Chinese Mustard Green recipe. When cutting the mustard greens, do take a whiff of its scent. You’ll be transported to mustard heaven. Lol! I really loovve its slightly nutty and peppery scent. I added some raisins to the Chinese Mustard Green rice. Plumped up when cooked, every mouthful of rice is filled with little bursts of sweetness that balances the Chinese mustard green’s bitterness. It also encourages my kids to eat this dish. So in this gai choy fan, you can taste the sweet (from the raisins), bitter (from the Chinese mustard green) and savory (from the roasted pork and rice). Mmmmmm… simply delish. This one-pot vegetable rice is perfect for lazy days. Whenever I cook this, I’ll do it in the morning and that’s what my family and I will have for lunch and dinner. It is delicious on its own but I often like to pair it with a soup. Today I cooked this with a light and tasty Chinese Sweet Corn Soup with Dried Scallops. See also this list of Chinese soup for suggestions. Oh, and don’t forget the bird’s eye chilis when you eat this! Or you can serve this with some sambal belacan too. 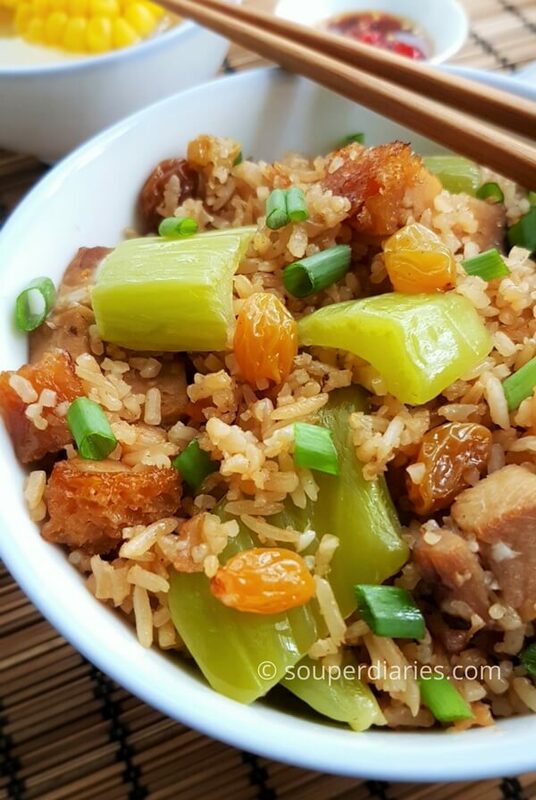 A flavorful and delicious one pot rice meal of Chinese mustard green and roasted pork as an accompaniment to your favorite Chinese soups. Heat up 1 tbsp of oil in a wok till hot. Add half of the minced garlic. Stir-fry till fragrant. Add chinese mustard and fry till it is partially cooked (about 3 minutes). Dish up and set aside. Pour in 2 tbsp cooking oil. Add minced dried shrimp and remaining minced garlic into the wok. Stir-fry till fragrant. Add roasted pork slices and raisins and fry for a few minutes. Add rice grains and stir for about a minute. Pour in seasoning and mix well to combine everything. Dish up and pour into a bowl for easier transfer to the rice cooker. Pour the rice mixture into the rice cooker. Use the rice paddle to smoothen the rice if necessary. Add water and turn on the rice cooker. When water in the cooker starts boiling, pour in the fried Chinese mustard. Close the lid and let it continue to cook. When the cooking time is up, open the lid and check on the rice. If you find it too dry, add in a small amount of water and continue to cook for about 5 minutes more. If it's just nice, fluff up the rice and let it settle for about 5 to 10 minutes in the rice cooker. Dish up and garnish with chopped spring onions. I was wondering what Kai Choy is. We call it “Kua Chai” in Hokkien. The only thing that beats your Chinese Mustard Rice is Chai Boey itself. I’ve been craving for it since this afternoon as I’m looking for some chicken rice stall that serves Chai Boey as well. ARgh.. all these food talks is making me hungry right at midgnight. I always refer to the Chinese mustard green as kai choy. I looked it up and saw that kua chai is the same thing. I love Chai Boey too. I will have a recipe of it in one of my upcoming posts. Just you wait. Lol!! Oriental cooking seems so complicated to me in the past. But this recipe seems to be an easy one to try out. I’ll have to explore your site for more recipes that are as easy as this one. Thanks. 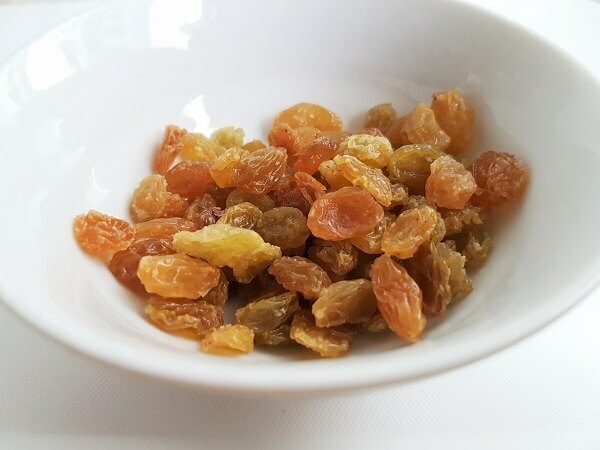 This made me hungry the instant I looked at it, although I would love to know if I could replace the raisins since I really do not like anything sweet in my food and I might skip that ingredient. Does the mustard lose its pungent smell after the entire dish is cooked? Yes, you can exclude the raisins if you’re not partial to anything sweet in your food. The rice will still taste great. The pungent scent will be muted after cooking but you can still taste a slight bitterness. I like pickled mustard green and have not had mustard greens with rice. I like that this recipe is sweet, bitter, and savory. When I was reading the post I was thinking all it needs is some spice and it would be perfect. And then I saw the spicy pepper! This looks delicious and I will give this recipe a try. Thanks and I hope you’ll enjoy this Chinese mustard greens recipe! This sounds delicious. I absolutely love Asian and Chinese food. After having spent 3 months travelling Southeast Asia, I believe I have found some of the worlds tastiest cuisine. I have never been a big fan of mustard, but even the sound of this recipe makes me want to jump right in and taste it and the flavours look like they will balance really well. Can’t wait to try this recipe at home with the wife. Love this Website! This dish looks so yummy and Healthy! I would like the sweet and sour in this dish Also! I do not have a wok. Would this be the same if I used an iron cast Skillet to cook it in? I definitely will be stopping back to see more Recipes! Thanks for the kind comments. I find that a wok is the best tool for the job as it has a higher wall. But yes, you can also use a cast iron skillet if it is big enough. You just need a short cooking time to partially cook the vegetables and meat in the skillet. Then pour into a bowl for easy transferring to the rice cooker. Hope that helps. Great recipe and easy to follow instructions. Quick question, can pork be substituted with another type of meat? In my family we do not eat meat but I still want to try this recipe. You can also use chicken if you wish. If you don’t eat meat at all, you can still cook this as the rice is tasty. Do let me know how it turns out. Your recipe for this bitter tasting vegetable looks really delicious. I always stir fry Kai Choy with garlic. It is the simplest dish that we can enjoy. It has been a while, though. Wow, wow, wow! What a nice recipe and the pictures are clear and beautiful! Also, it is very easy to understand. Chapeau! I didn’t know what is Kai Joy until today. Very interesting! I will try this recipe next week. I just would like to know if it’s possible to find Chinese Kai Joy in the supermarket? Thanks for your kind comments. 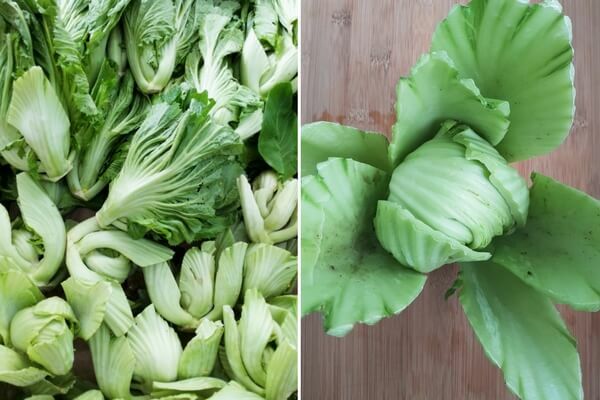 I’m not sure if you’ll find the Chinese mustard green (kai choy) in the supermarket. I seldom see it there so I always buy it from my local market. But you can try looking for it in the supermarket though. I hope you’ll like this recipe.